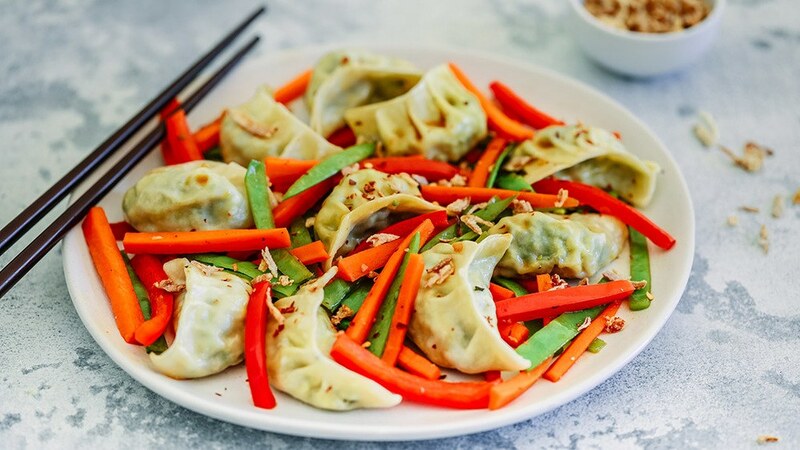 Think fat juicy dumplings, lightly pan fried fresh veg, and a flavour packed sauce. Dumpling Stir Fry is a dinner recipe worth getting excited about. Preheat the sesame oil in a deep frying pan over medium to high heat. Transfer the frozen dumplings to the pan and cook for 4 minutes. Reduce heat to medium, add 5 tbs water to the frying pan and cover with a lid or aluminium foil. Steam for another 4 minutes until the dumplings are cooked. Remove the dumplings from the frying pan. While the dumplings are cooking chop the carrot, capsicum and snow peas into thin matchsticks and mince the garlic. Set them aside. Reduce heat to medium high and add the carrot, capsicum, snow peas and garlic to the frying pan and cook, stirring occasionally, until the veggies are tender, but still crisp. Meanwhile, in a small bowl whisk together the soy sauce, rice wine vinegar and chilli flakes. Transfer the dumplings back into the frying pan and pour over stir fry sauce. Gently give all the ingredients a stir. Divide the dumpling stir fry between 2 bowls and drizzle with any sauce remaining in the bottom of the frying pan.